I have been told I become a different person on the trail on a mountain bike ! I must say it does always make me smile and reminds me of the freedom I felt as a child. My chicken soup for the soul ! It restores my mind as I escape into the leafy shadows and even the same trails in Knysna may have a different feel each time you ride them. The climbs may be tough but what goes up must go down and the exhilaration of the descents grabs me every time. 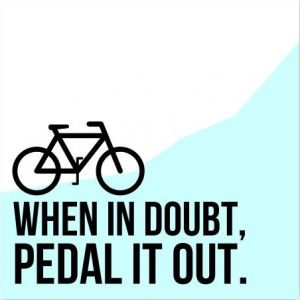 I don’t ride as often as I would like to – other parts of life tend to get in the way. Now my eldest daughter is taking to mountain biking I get to share the joy with her at weekends – nothing quite soothes like pedalling out the stress of the week. It makes me happy and uplifts my spirit. And sharing a ride with good friends adds to the pleasure – the ride is a reward in itself but the company and the pizza and beer afterwards aren’t bad either !